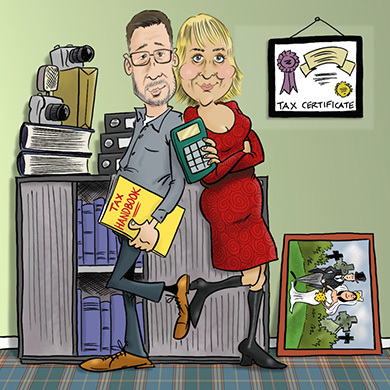 We prepare tax returns for photographers and image makers. Our service is unique because we've been in your shoes. We photographed weddings for 15 years before launching Shuttertax. We know your industry. We understand as much as you that photography can be all consuming. Whether it's meeting clients, processing images, keeping on top of your website and blog, updating social media, or trying to get onto the first page of Google, there is always something more pressing and usually far more interesting to do than keep on top of your books. Well, we can help make this completely stress-free. By using cutting-edge cloud software you'll no longer need to wrestle with an Excel spreadsheet or try to figure out how to work the desktop software you've just forked out an arm and a leg for. You'll deal exclusively with people who know exactly how you feel because we've been there ourselves. We're easy to contact and we'll often reply to emails outside of business hours. We won't tie you into a contract and our pricing is completely transparent. If this sounds like it's exactly what you've been looking for, please get in touch, we'd love to hear from you. Your time is so much better spent focusing on what you're good at. You'll be able to access your accounts in real time wherever you are and never have to worry about missing deadlines. There will simply be no need to send paperwork through the post or email huge back-up files and you'll have peace of mind that your data is always secure and backed-up. In the near future, all small businesses will have to update new HMRC online accounts every quarter. Not only is cloud software beneficial in so many ways, it will also be essential.